Haliclystus stejnegeri belongs to the order Stauromedusae, the stalked jellyfish. Unlike other jellyfish Stauromedusae do not rythmically pulse but stay in a sessile polyp form for most of thier life and lack a pelagic phase. H.stejneger attaches to the substrate using adhesive fibers formed from substances secreted from its basal disc. It is bilaterally symmetrical with eight arms and eight gonads. It is most commonly found attached to eelgrass or seaweed in low intertidal habitats. H.stejnegeri can be distinguished from other species by the four interradial white stripes and the shape of the anchors. 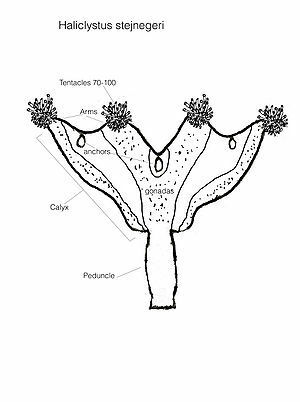 H. stejnegri has a funnel shaped calyx generally around 10-12 mm wide, with a relatively short peduncle around 7-8 mm long. The exumbrella is smooth and fairly unresponsive but the subumbrella is extremely sensitive to outside stimuli. 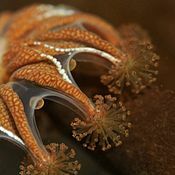 It possesses eight arms, each tipped with a cluster of tentacles used for feeding and for holding on to the substrate should it become dislodged. The eight marginal anchors between the arms are believed to be used in mobility through a somersault like motion. It can come in a variety of colors ranging from reddish brown, orange to yellow and green varying with the environment. ↑ G. F. Gwilliam, (1960), Physiology of a Sessile Scyphozoan, Biological Bulletin, Vol. 119, No. 3 pp. 454-473. This page was last modified on 22 March 2011, at 10:44.